A weekly retainer in the amount of $1,250 – every week for two consecutive years. That’s the payoff of the new Parnassah Raffle. Do the math and you’ll arrive at a grand total of $130,000! Would you like a chance at winning it? Entering the raffle is actually quite simple and the best part is that your donation supports a worthy cause. Proceeds go directly to Mosdos Bobov in Eretz Yisroel, enabling them to continue fostering Torah study throughout the land of Eretz Yisroel. Plus the Parnassah project is being undertaken as a zechus for the neshama of R’ Bentzion Dunner a”h. I think this is an amazing opportunity for Tzedakah and Parnassah rolled into one, and I’ve not only entered the raffle, but I’ve signed up to help spread the word about it. 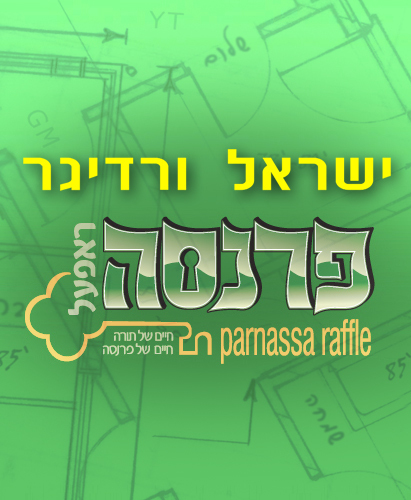 To purchase an entry ticket to the Parnassah raffle, please Click Here and you’ll not only be entered into the Grand Prize drawing but a bonus drawing every Rosh Chodesh for $1,000 cash. You’ll automatically be entered into the Bonus Drawing every month until the Grand Prize drawing will be held on March 10, 2010. P.S. Don’t delay – the earlier you enter the drawing, the more chances you’ll have to win an additional $1000 each month.